Following the highly successful recordings of Beethoven’s Symphonies nos. 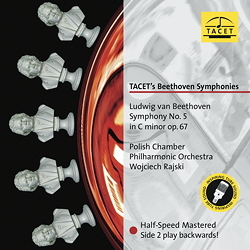 1, 2 and 7 with the Polish Chamber Philharmonic Orchestra under Wojcieck Rajski, which the TACET label released on vinyl, a further work in the series is surely eagerly awaited. Beethoven’s Symphony no. 5 is a work which puts a conductor to the test and many maestros and orchestras have demonstrated their competence with its interpretation in the past. Thankfully, Rajski does not attempt to outdo the crystalline coldness and severity which is currently fashionable and found in other recordings. Rather, he gives weight to the grim fate motif in the first movement by means of a swift tempo and gentle timbre. With chamber-music-like airiness and doting wonderfully on the interwoven parts, he enables the listener to get to the heart of the two middle movements and highlights subtleties which are hidden even from Beethoven specialists. In the final movement the orchestra finds the ideal medium between silky symphonic brilliance and analytic precision and confidently leads the sweeping C major final section to a magnificent close.